It was the second start day of the PokerStars.com European Poker Tour London on Monday at the Victoria Casino on Edgeware Road on Monday. Another 411 players walked through the revolving doors with the £5,250 entry fee in their hands and the hopes of succeeding Benny Spindler as the EPT London champion for Season 9 of the European Poker Tour. 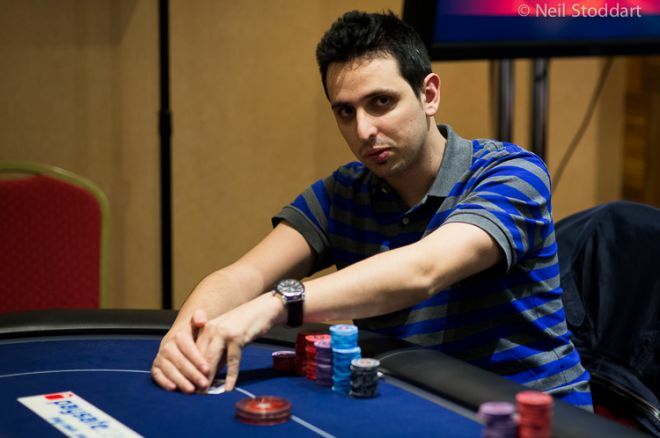 Eight 75-minute levels later, Sergio Aido, the Spaniard who won the UKIPT on Sunday, continued what could only be described as amazing form and finished the day as the overall chip leader with 215,200. Aido picked up £144,555 for the UKIPT win and in the only other tournament he has played this week, he chopped a £1,000 no-limit turbo event for £20,000 with former EPT Monte Carlo winner Nicolas Chouity. So, his form has been quite decent so far. Chris Moorman flew the flag for the home country and managed to six-bet all in with suited against Steve Warburton's pocket queens for a 110,000-chip pot with the blinds only 200/400 with a 50 ante. Moorman cracked the queens, and Warburton could've been forgiven for thinking he should not have returned back after the dinner break. Following the break, he suffered another horrible beat at the 250/500/50 level, losing with pocket nines to seven-eight suited for a 50,000-chip which sealed his elimination. Moorman thrived in the meantime, finishing the day with 159,800 in chips. Team PokerStars Pro Daniel Negreanu, fresh off Sunday's team victory over The Professionals from Full Tilt Poker, had a low-key day, eventually busting in a coin flip for a 15,000-chip pot just before the dinner break. Negreanu was joined on the sidelines by fellow Team Pros Jake Cody, Fatima Moreira de Melo, Joe Cada, Vanessa Rousso and Dario Minieri who won't have great memories of the London event this time. Cody lost a crucial flip to the online wizard Viktor Blom while Moreira de Melo also busted in a flip. Other people who busted today included: James Dempsey, Todd Terry, Craig McCorkell, Joao Barbosa and Dan Shak. They'll all have a chance at the side events being played at the brand spanking new PokerStars Live at the Hippodrome venue in Leicester Square. Someone who enjoys London a lot is the hometown girl Vicky Coren, having won this event for a cool £500,000 back in Season 3. She finished the day with 44,000 to make it to Day 2 joining other notables including Vojtech Ruzicka (122,300), Sam Trickett (80,400), Barry Greenstein (79,900), Toby Lewis (79,200), Bertrand "ElkY" Grospellier (65,600), Faraz Jaka (61,600) and Jason Mercier (58,300). Grospellier was one of several players to join a table christened “The Table of Doom” which featured at one point, Jude Ainsworth, Bryn Kenney, Sandra Naujoks, Shannon Shorr, Andrew Chen and Martin Jacobson — quality worthy of any final table and one that took a starring role on EPT Live. Be sure to join the Pokernews Live Reporting Team on Tuesday for Day 2 from 12 p.m. GMT for the next chapter of this tournament as we expect to play six more 90-minute levels of exciting action. Interested in getting in on the action? Check out our PokerStars review page today and take advantage!